Romnick Sarmenta and wife Harlene Bautista seldom ride together due to their busy schedule running their restaurant, Salu, among other things. At age 15, actor Romnick Sarmenta started riding motorcycles. But because of his tight schedule in the showbiz industry, he hardly had time to ride his bikes which he considers an effective stress buster. And now that he’s a full-fledged family man with five children, it's more difficult for him to find time to engage in a relaxing long ride. Believe it or not, since the time he bought his first bike, a Yamaha Virago, he hasn’t had a chance to go out of Metro Manila on two wheels. “I have to ask permission from my wife,” says Romnick, now 44 years old and married to fellow showbiz personality Harlene Bautista. 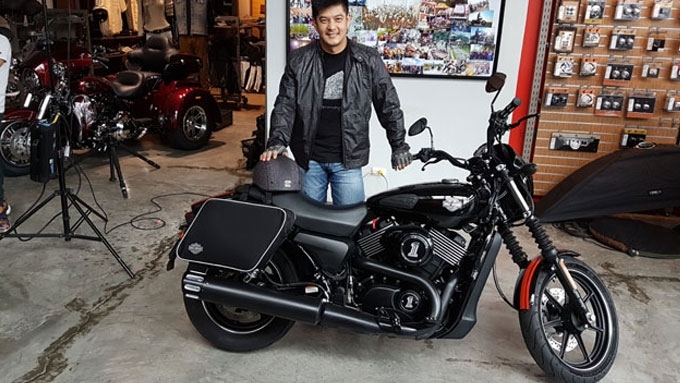 We chanced upon Romnick at the Harley-Davidson of Manila showroom on EDSA while waiting for his newly purchased Street 750 to be released by the service team. Aside from the American street fighter, he owns a 2013 Vespa LX 150 which has an odometer reading of only about 400km up to now. While he dreams of doing long rides, even just to Batangas or Tagaytay, he has to be content with just riding short distances doing errands for his family or rushing to a film shoot. He also recalled that Harlene used to ride with him on motorbikes when they still had only three children. Now, they seldom ride together due to their busy schedule running their restaurant, Salu, among other things. He is also into customizing cars and almost landed in the pages of our magazine, until his show car figured in an accident before the photo shoot. Romnick claims he’s a cruiser bike fanatic. He tried riding sport bikes a few times but this caused him body aches. He also dreams of owning a Harley-Davidson Sportster 48. He was excited to see his Street 750 Special Edition roll out of the showroom with all-original Harley parts, complete with a five and 3/4-inch Daymaker Projector LED headlamp, Dark Custom Air Cleaner Trim, Right Side and Left Side Medallion, Edge Cut Foot and Shifter pegs, hand grips, small brake pedal pad, and muffler end cap. His new Harley looks even more stunning with its Script Fuel Cap Medallion, Screaming Eagle 10mm Phat Spark Plug Wires, Street Decal Kit, and Tank Knee Pad Kit. It was obvious that Romnick is itching to ride his beautiful bike, but again it seems that Harlene is holding the keys.